Polbase - Reference: Nucleotide-induced DNA polymerase active site motions accommodating a mutagenic DNA intermediate. Nucleotide-induced DNA polymerase active site motions accommodating a mutagenic DNA intermediate. DNA polymerases occasionally insert the wrong nucleotide. For this error to become a mutation, the mispair must be extended. 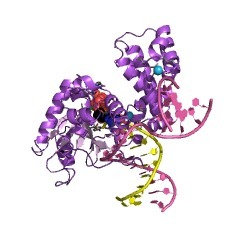 We report a structure of DNA polymerase beta (pol beta) with a DNA mismatch at the boundary of the polymerase active site. The structure of this complex indicates that the templating adenine of the mispair stacks with the primer terminus adenine while the templating (coding) cytosine is flipped out of the DNA helix. Soaking the crystals of the binary complex with dGTP resulted in crystals of a ternary substrate complex. In this case, the templating cytosine is observed within the DNA helix and forms Watson-Crick hydrogen bonds with the incoming dGTP. The adenine at the primer terminus has rotated into a syn-conformation to interact with the opposite adenine in a planar configuration. 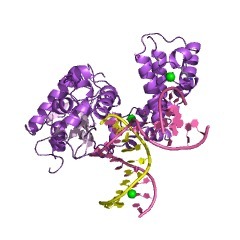 Yet, the 3'-hydroxyl on the primer terminus is out of position for efficient nucleotide insertion.